Find out everything you need to know on the new Jaguar F-pace from independent vehicle review website Car And Driving. You can watch the video review to the left to see more of the car or read their written review below to get a true insight from an expert in the automotive industry. Jaguar's best selling vehicle is its F-PACE luxury SUV. To keep the momentum going, the brand has introduced a range of fresh engine options. Jonathan Crouch reports. The F-PACE has taken Jaguar in a bold and different direction and will be crucial to the brand's future if it's to expand its sales and take on key rivals. It brings a well-judged compromise of class, performance and capability to the luxury mid-sized SUV segment and provides a tempting alternative to the established German players in this sector. In short, this car was well worth the wait. If there's one type of car that epitomises this period in motoring history, it's the SUV. So many buyers desire them and Jaguar has long wanted a slice of this action. As a result, in 2016, the British company finally brought us the F-PACE, its first ever model of this kind, complete with high-riding driving position, four-wheel drive and even some decent off-road ability. Given the Jaguar Land Rover company background, this could have been little more than a re-badged Range Rover Sport beneath the skin. In the event, it turned out to be very much its own car, with underpinnings owing far more to Jaguar's XE and XF saloons. The only issue at launch was a slightly restricted range of engines, someting that's been put right within this improved model range. These days, the 2.0-litre diesel unit that almost all buyers want is available in an efficient 163PS 'E-Performance' guise, as well as in the 180PS form that most customers choose. As before, an AWD system is optional further down the range. Go for the pokier 180PS unit and there's the option of auto transmission with either AWD or rear wheel drive if you want it. The 2.0-litre Ingenium diesel can also be ordered in high-output 240PS '25d'-badged form, where it can get to 62mph in just 7.2s. At the top of the diesel line-up, the AWD 3.0 litre V6 turbodiesel variant continues on with 300PS, which allows it to reach 62mph in a brisk 6.2 seconds. There's also a couple of 2.0-litre Ingenium petrol versions offering either 250 or 300PS; even the 250PS version gets to 62mph in 6.8s. If you want to go faster, there's always the supercharged 3.0-litre petrol unit that's also found in the F-TYPE. 0-62mph takes just 5.5 seconds while it's limited to 155mph. The smaller diesel is the only engine that can be had with a manual transmission - a six-speed unit. The V6s are only available with the auto. Suspension is the same as you'd find on the XE and XF saloons, meaning double wishbones up front and Jaguar's 'Integral Link' independent setup at the rear. Extensive use of aluminium reduces unsprung weight improving both ride quality and handling too, both things Jaguar are renowned for. It isn't just the suspension that's shared with the XE and XF saloons; there's also a version of Jaguar's 'Lightweight Aluminium Architecture' that's scalable to a variety of sizes. This, along with a composite tailgate and selective use of magnesium, allows for a weight of under 1700kgs for the entry-level rear wheel drive F-PACE. To put that into perspective, it's nearly 100kg less than a similar BMW X3 that has 30 fewer horsepower. Not only is this Jaguar light, it also has a perfect fifty/fifty weight distribution to help handing too. Style wise, the F-PACE stays surprisingly close to 2013's C-X17 prototype, including plenty of F-TYPE-inspired touches. There are some differences but you can even get 22" wheels for the full concept car look. Incidentally these are not only an inch larger than competitor's wheels but they are better protected against curb damage too thanks to chunky sidewalls for the tyres. You may sit higher than any other Jaguar but it still feels more sports car than SUV and there's no seven-seat option either. At least there are plenty of premium interior touches including real metal and proper wooden veneers. While 'All Surface Progress Control' is an option, don't mistake this for a proper off-roader. Jaguar have cleverly distanced themselves from Land Rover in that respect. There are four key models within the F-PACE range, 'Prestige', 'R-Sport', 'Portfolio' and 'S'. 'Prestige' may be the starting point at around £35,000 but you still get heated leather seats, a powered tailgate, parking sensors at both ends, 18" alloys, a Bluetooth infotainment system with sat-nav and daytime running lights. Starting at about £37,500, 'R-Sport' adds more aggressive body styling, 19" wheels and sports seats, while for around £52,000 'S' models get one of the V6s, 20" wheels, a rear view camera, a 380w stereo and even sportier styling. 'Portfolio' is the luxury option but can be had with the 2.0-litre diesel for just shy of £40,000. Over 'Prestige', it adds a panoramic roof, heated front screen and headlight washers as well as a leather-effect dashboard top. Options include a 12.3" virtual instrument cluster similar to that offered by Audi, an uprated infotainment system and four-zone climate control. The F-PACE should be commended for offering autonomous emergency braking as standard on all models, along with a lane departure warning system and traffic sign recognition on top of airbags and all the electronic nannies we take for granted these days. Those that tow will also appreciate the trailer stability assist. The F-PACE possesses a set of economy and emissions figures that many a smaller, slower vehicle would be proud of. The greenest vehicle in the range is the 163PS 2.0-litre rear wheel drive diesel 'E-Performance' variant which is capable of 59.2mpg on the combined cycle with just 126g of CO2 emitted per kilometre. With the 180PS version of this unit, the figures drop only marginally to 57.6mpg and 129g/km. Should you opt for AWD on a 2.0d 180PS derivative, economy drops by just 3.4mpg with CO2 up by a lowly 5g/km. Add an automatic to that and economy drops by a single mpg. However, CO2 increases by another 5g/km. If you plan on getting one of the V6s, the diesel manages 47.1mpg and 159g/km. As for petrol power, the 2.0-litre four cylinder 250PS AWD model manages38.2mpg and 170g/km, while the V6 supercharged variant returns 31.7mpg and 209g/km. A three year unlimited mileage warranty is standard with the F-PACE, although this can be extended with a number a couple of different plans that include a cover for an MOT test failure up to £750, as well as the normal cover for most electrical and mechanical systems. Service intervals are every two years/21,000 miles. The F-PACE has been well received - and with good reason. Look at it, drive it and analyse it and you feel you've a product born out of generations of development. 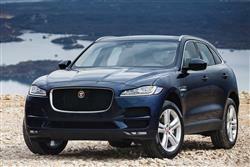 It's hard to believe this to be Jaguar's first stab at the SUV segment. It's one of the stand-out contenders in this corner of the SUV market, no small achievement when you look at the quality of the competition. True, it might not be as rough road-ready as a Land Rover product. Or as track-tailored as a Porsche Macan. Most buyers in this segment though, don't want a mid-sized luxury SUV at either of those two extremes. They want a car like this. A sporting SUV to savour.